Tourmaline jewelry has a unique charm and elegance. This beautiful gemstone comes in many colors, which is why people call it “the Rainbow” gem. Whether you want to buy precious & semi precious stones jewelry or simply to enhance your gemstone knowledge read further. We have prepared an interesting guide that will help you choose the best tourmaline jewelry for your collection. A long time ago, people discovered tourmaline in the East Indies, but nowadays they mine also from Australia, Africa, Asia, North America, and Europe. At the base, tourmaline is a crystal silicate which comes in many colors. It has a hardness of 7.5 on the Mohs hardness scale which makes it an ideal choice for jewelry. Tourmaline is durable, beautiful and diverse so what else is there to know about it? Read further to find out how to buy tourmaline jewelry. It will surprise you to find out, but there are actually a handful of minerals under this name. One of the factors that drives the price of this gem is its color, of course. Green tourmaline jewelry has been popular for some time now. Whether mint green or with a yellow or blue tint, this type of tourmaline offers great clarity. Another great thing about it is that green tourmaline jewelry doesn’t receive any type of treatment. Its color is 100% natural. Chrome-colored tourmaline has a vibrant, deep green color. This is one of the rarest types of tourmaline so expect it to be more expensive than other varieties. However, even though expensive, chrome-colored tourmaline jewelry doesn’t offer the same clarity as other types. The stone has some inclusions visible to the eye, so it requires expert cutting. Blue tourmaline jewelry is stunning and precious. Because it is rarer than other varieties (except chrome-colored and Paraiba tourmaline), it is also more expensive. However, when buying it you should ask for a certificate. Shady jewelry stand will sometimes try to pass off an irradiated stone as blue tourmaline. 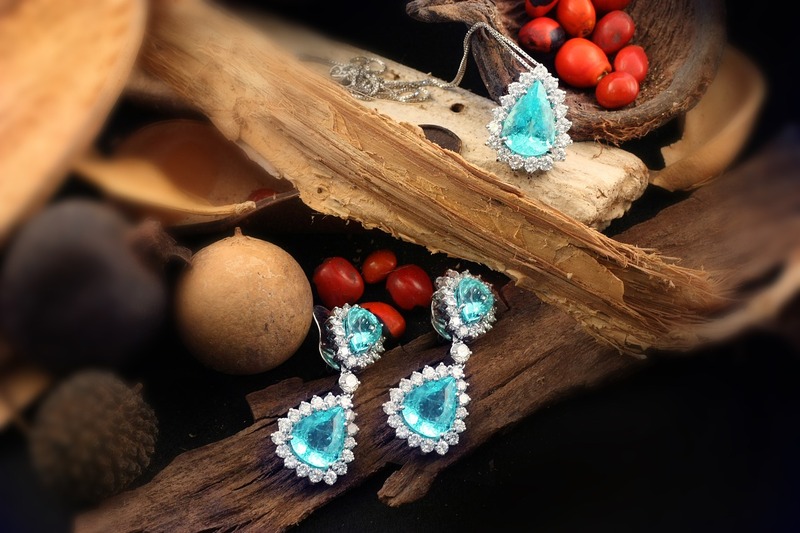 Paraiba tourmaline is the most coveted one. You have probably heard of it before as it is one of the rarest gemstones in the world. It has a rich blue or neon color and its price per carat can reach up to $8,000. Red & pink tourmaline jewelry is very popular at the moment. You can find it in any jewelry shop and it looks gorgeous set in white gold, platinum or silver. Watermelon tourmaline is a very unusual stone. It features two colors, red and green, separated by a white strip. It looks spectacular and can be turned into amazing jewelry pieces. But you should expect to pay more for it as it is not only rare, but it also requires expert cutting skills. Canary tourmaline jewelry is extremely rare and has a beautiful yellow color. You will, probably, find it in small stones, about one or two carats. “Canary tourmaline” stones that are very big may not be real tourmaline. Usually, tourmaline has a good clarity but some inclusions may appear as the gemstone forms in liquid-rich zones. If you want to buy pink or red tourmaline jewelry, its inclusions will not decrease their value because these varieties are rarely without inclusions. However, if you want to buy other tourmaline colors, you should know that a low clarity automatically means a lower price. Don’t pay too much on tourmaline jewelry with many inclusions. What is interesting to know about the weight of tourmaline is that, once you pass 5 carats, the price will go up. Tourmaline gems under 5 carats, except for Paraiba or Chrome-Colored, are, usually, inexpensive. Of course, the final price of the tourmaline jewelry will depend on the metal as well. A silver tourmaline ring will be less expensive than a white gold or platinum one. The answer is yes. Except for green tourmaline, all the other types can receive a treatment. Many tourmaline stones are heat-treated to enhance their color, but this doesn’t affect the gem’s durability. It affects, however, the way you take care of the gem. With treated tourmaline jewelry, you cannot use mechanical cleaning methods like ultrasonics. You can only clean them by hand so it’s important to ask the jewelry whether the stone has been treated or not before you buy it. Other treatments may include resin and oil injections, as well as color injections. It’s always a good idea to ask whether the gem has received a treatment or not. If you liked reading about tourmaline jewelry, check out our other articles as well. To see Ana Luisa’s unique gemstone jewelry collections, visit our online jewelry shop.